Courtesy of Doug Woodring, Bosphorus, Turkey. There are increasingly more and more swimmers who do eco-swims, promote clean seas and swim for the environment or do a swim that calls attention to plastics in the world's oceans. 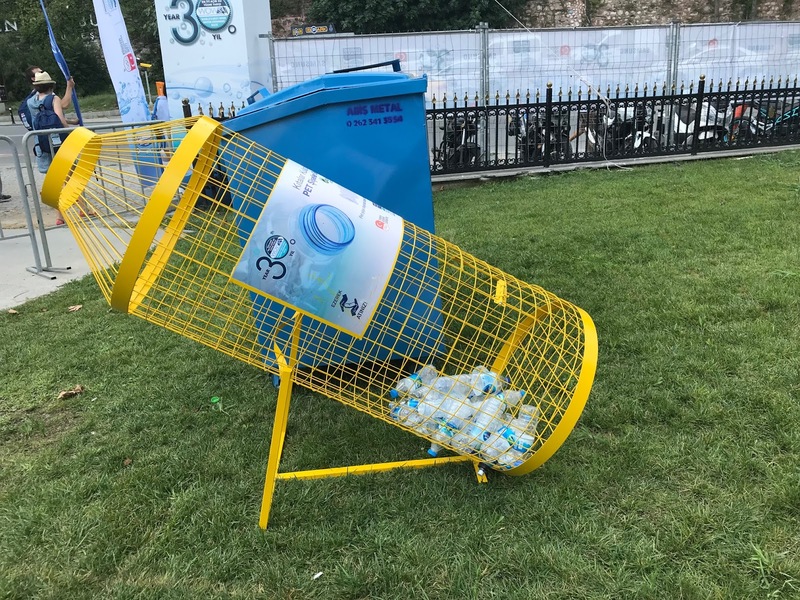 But the organizers of the Samsung Bosphorus Cross-Continental Swim are going many concrete steps further to eliminate and eventually prevent plastics at its annual event. The race was first sports event in Turkey to implement the PDP Sport program that requires actual actions that specifically reduce and eliminate plastic waste to be generated at sports events. 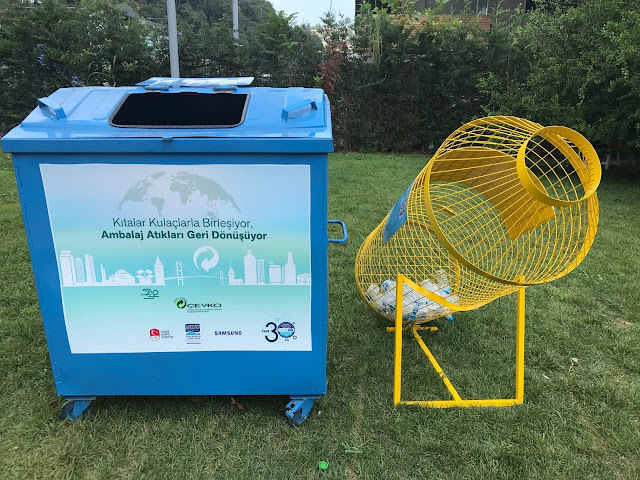 On the shores of the Bosphorus in Turkey Doug Woodring explains the initiative, "Sports events, their sponsors, participants, venues, suppliers and spectators increasingly wish to improve their sustainability and reduce their environmental impact. Ocean Recovery Alliance and its Plastic Disclosure Project enable initial steps that sports events can take in this direction by minimizing their plastic footprint. These guidelines and a comprehensive checklist assist event organizers with the planning necessary and a specific scorecard to help evaluate their progress towards certification as a PDP Sport event. These guidelines are very achievable for most events. For events that already pride themselves on their sustainability, they can stretch further and seek ISO 20121 certification." The PDP Sport guidelines are posted here. 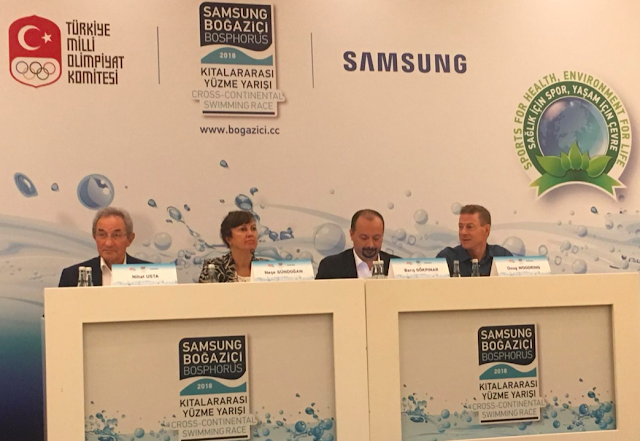 The Samsung Cross Bosphorus Swim was selected as the 2016 World Open Water Swimming Offering of the Year and continues to be innovative and creative in its approach to developing the sport of open water swimming. 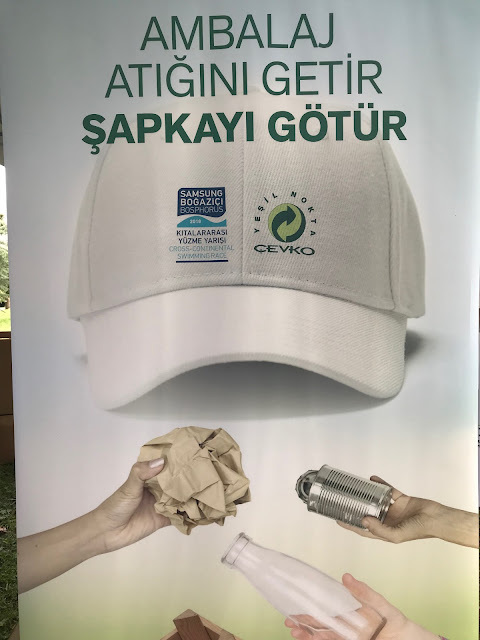 Woodring describes their actions, "In cooperation with the far forward-thinking Turkish Olympic Committee, the Samsung Cross Bosphorus Swim on its 30th anniversary is the first large global open water swimming event, and the first sports event in Turkey, to utilize PDP Sport in order to reduce plastic waste at their event. The organizers and sponsors took a number of concrete and visual steps (see here) in planning this year's 30th edition of the 6.5 km cross-continental swim crossing of the Istanbul Strait that connects the Black Sea with the Sea of Marmara in Turkey. The navigationally challenging course requires swimmers to jump from a ship at Kanlica on the Asian side of the Bosphorus and swim cross currents to the finish on a dock at Kuruçesme on the European side of the Bosphorus. The competition started in 1989 with 68 swimmers and has recently grown to 4,892 applicants for the 2,472 available spots. Woodring further explains the background of the Plastic Disclosure Project, "PDP Sports was launched at the Clinton Global Initiative by Ocean Recovery Alliance as a way to bring about large scale prevention of plastic waste. This is an investor and multi-stakeholder driven program to encourage companies and other institutions to measure their plastic footprint and develop plastic management strategies to create a world where plastic adds value to businesses without negatively impacting the environment. Its guidelines have been adopted by the World Open Water Swimming Association that incorporates is recommendations, planning, and checklist into its sanctioned open water swimming events. Our approach is simple: an annual disclosure request is sent on behalf of socially responsible investors and other community stakeholders to companies around the world that are users of plastic in their products or services, asking them to measure their plastic footprint. The goal is to inspire improved strategies for lessening plastic's impact on the environment, managing the material in more efficient ways, and treating it as a resource instead of a waste product. This includes less waste in the supply chain, more recycling within one's user-base, more recycled content, new design, and the use of new materials."